The Simplyhealth Great Stirling Cross Country - Timeline Television Ltd. The Simplyhealth Great Stirling Cross Country took place this weekend. The XCountry pits the best of Great Britain against Europe and the USA. Athletes compete across three races – the senior men and women’s races and the innovative and exciting International Mixed Relay event where mixed teams compete for the Stewart Cup. Timeline was pleased to provide RF facilities for FilmNova’s production which involved supplying radio cameras and an uplink from one of our latest RF trucks, RF3, which was onsite at Stirling. Back at Timeline’s Ealing Broadcast Centre, the international incoming feed was received via satellite, with commentary provided by Rob Walker from our dedicated VO booth, and the final programme was streamed live over the web to USA Track and Field and European Athletics via Delta Tre. 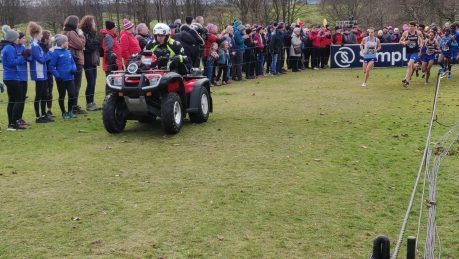 The Simplyhealth Great Stirling XCountry was live on BBC Saturday 12th January at 1.15pm.